WordPress as awesome it is still doesn't provide any backup facility for your website. If you are a concern WordPress website owner then you know the importance of creating a backup of your WordPress website in a timely manner. That 's where exactly our BackupBreeze WordPress plugin comes into action. It fulfills the need for WordPress website backups. If ever, your website crashes or you face issues regarding website hacks, malware, user error, deleted files, BackupBreeze will be there to restore your website with just one click. Database backup: Complete database backup feature. Complete backup: Let you backup WordPress site, including your database and all WordPress files. Scheduled backup: Run automatic schedules backup of WordPress websites. Creating a backup of your WordPress website in a timely manner. With BackupBreeze you get an option to either do a database backup, only file backup or complete backup WordPress site. It works with irrespective of your WordPress version, Database size or it's complexity. With an automated backup schedule feature, you can choose off-peak traffic hours to backup for reducing the processing load on your hosting. Your website will never load slow, which is often the case with other backup plugins which run multiple processes in the background. They often use a lot of server resources resulting in slow website loading speed for your audience. It can hamper your website speed performance and may result in a drop in Google ranking. With BackupBreeze you get to choose the time for running backup when there is a low number of the user coming to your website. To backup WordPress site, it is the best time. 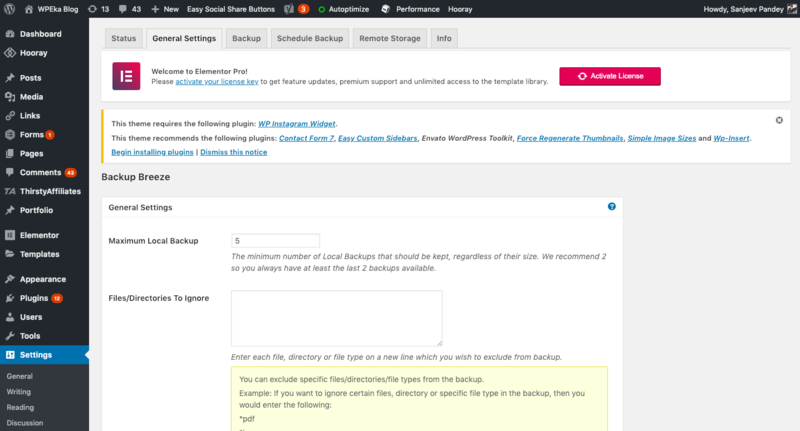 The WordPress backup plugin has an option to save the backups of your WordPress website on remote servers. 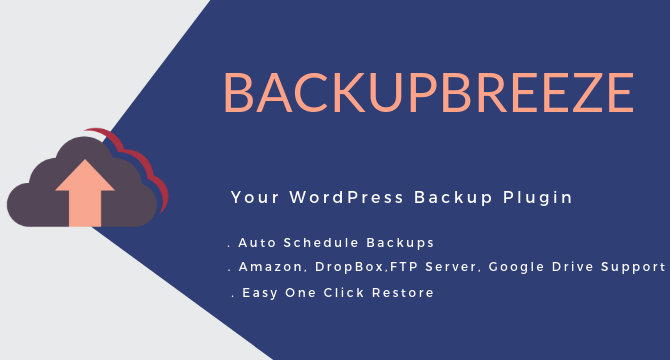 You can choose either Amazon, Dropbox, FTP Servers or simply Google Drive to save your backup database files and do a complete backup WordPress site. The auto-scheduler ability of this WordPress backup plugin makes your life simple. Just choose the date and time of the day and sit back, while BacupBreeze saves the backup of your WordPress database files on remote servers safely. BackupBreeze has an option to restore your website right from the admin dashboard. With less complexity in mind, the plugin is designed to be super easy to use. This makes sure that the website has a minimum downtime and is always accessible to your audience. In case you work in a local or temporary environment, you can move your complete WordPress site within seconds. Schedule daily, weekly or monthly auto-backups. Choose what to backup: Full website, Database or complete backup. Start backups at off-peak hours without slowing or putting a lot of processing on your server. You can just sit back and let BackupBreeze take care of the process after setting the auto backups setting in the dashboard. There is built-in logic to avoid temporary files or log files from backing up. You can also choose which files to not backup. The features help saves space by allowing you to select which file types you don't wish to backup. This will keep the size of your backup files low and makes storing easy. Because of this feature, you save a lot of space on your storage. This WordPress backup plugin gives allows you to download and restore your website from an independent backup file. WordPress backups are not dependent on the plugin itself. Easily schedule daily, weekly, or monthly backups for your site. Automatically take backups to Amazon S3, Dropbox, FTP, and Google Drive. Choose what to backup (database backup, file backup or complete WordPress Backup). If you are not already backing up your site, then you should pick this backup WordPress plugin and start using it right away.